Korean developer Gamevil seeks to pack an epic experience into a tiny space with Zenonia, an action roleplaying game for the iPhone and iPod Touch. Zenonia follows a young man named Regret as he searches for answers to the mystery surrounding his birth after the sudden death of the man who raised him. Players start off the game by choosing one of three classes - paladin, warrior, and assassin - each with their own set of skills, strengths, weaknesses, and play style. The game features the classic look and feel of games like The Legend of Zelda: A Link to the Past, combining it with several more modern roleplaying conventions, such as skill trees, special moves, and weapon enchanting. With around 20 hours worth of play in the main story and the ability to choose between good and evil paths, Zenonia stuffs an enormous amount of game play into a relatively small iPhone title, but can an epic adventure thrive on a platform that tends to focus on smaller titles? A Full-Featured Action RPG: This isn't some light, throwaway role-playing game. This is the total package, with three classes, skill trees, equipment levels, different skill builds, side quests, special attacks, and more. Zenonia can easily stand toe-to-toe with any action RPG on the Nintendo DS, and could even give the best the PSP has to offer a run for its money. You can easily squeeze upwards of forty hours out of the game, and when you consider you're only paying $5.99, the value is pretty much insane. Style With The Substance: Providing a lot of game play is only half of the equation. Zenonia's anime-inspired art style fits perfectly with the overall tone of the story. Memorable characters and a tongue-in-cheek sense of humor that sometimes breaks the fourth wall keep the game entertaining throughout its expansive length. The only real flaw in presentation, aside from a few misspellings, is the constantly looping soundtrack, which while charming at first, quickly wears on you. Touchy Controls: Where the rest of the game shines, the controls fall flat. Controlling Regret with a virtual control pad and action button is at times extremely frustrating, especially for those of us with larger snausage fingers. Navigating the menus is particularly painful, and the inventory screen is far too small and cluttered for such imprecise controls. Note that the developers have already submitted an update for the game to Apple which widens the control area, addresses the inventory system, and allows you to listen to your own music as you play. I've been following the roleplaying game scene on the iPhone ever since I got my hands on my first iPod Touch, and while I've been amused by some of the offerings I've seen for the device, I never expected anything quite as expansive as Zenonia. It is a massive game, with an impressive amount of variety and customization lurking beneath its seemingly simplistic outer shell. This is the sort of title you scan message boards for, trying to determine the best skill build for your assassin, or arguing the merits of paladins over warriors. It's more than deep enough to have been successful as a retail release on more traditional handheld systems, yet here it is, for $5.99 on the iPhone. If you're a fan of the action RPG and own an iPhone or iPod Touch, there's really no reason for you not to play Zenonia. It's an amazing game that sets the bar for the genre on the iPhone platform. 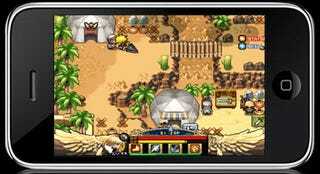 Zenonia was developed and published by Gamevil for the iPhone and iPod Touch on May 24th. Retails for $5.99. Played through to final boss as an evil assassin; toyed with other two character classes.